Domestic PE prices have opened the post-holiday period on a rising trend in China, with players citing supply limitations stemming from the recent typhoon in eastern China along with strong LLDPE futures prices as the main reason for higher prices. 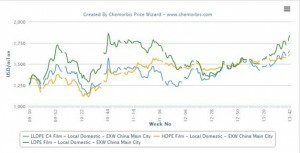 The most recent hikes have pushed local prices to.Domestic PE prices have opened the post-holiday period on a rising trend in China, with players citing supply limitations stemming from the recent typhoon in eastern China along with strong LLDPE futures prices as the main reason for higher prices. The most recent hikes have pushed local prices for LLDPE and HDPE to their highest levels of the past four years while LDPE prices have hit a three-year high. 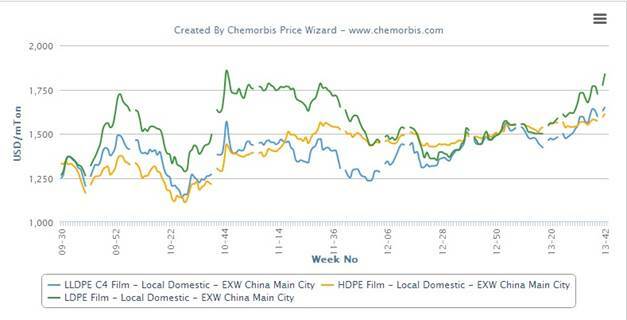 According to data from ChemOrbis Price Index, local LLDPE prices have jumped $89/ton since the start of September on an ex-warehouse China basis while HDPE prices have risen $63/ton over the same period. Meanwhile, LDPE prices saw the largest jump of any PE product, gaining $164/ton compared with the beginning of September. Supply issues are also being reported from Iran, which has become a key PE supplier to China. According to data from Chinese Customs, Iran has been the largest exporter of HDPE to China during the first eight months of 2013, narrowly topping Saudi Arabia with total exports of 593,432 tons. Iran has also been the country’s top supplier of LDPE, exporting 240,688 tons during the first eight months of the year, well ahead of the 146,014 tons exported by South Korea, the country’s second largest LDPE supplier.